A few weeks ago my wife and I went shopping at the local asian grocer. Well my wife went shopping at the local asian grocer, I hung out with her for about 10 minutes and then decided to go to the bottle shop next door to see what I could see. I like to go hunting through random bottle shops, trying to find rare or obscure bottles. I've picked up a few hard to find bottles pretty cheap due to the fact that the staff and owners didn't realize what they had. It's a bit of a treasure hunt for me. Even more I go through the local bottle shops to see what beers of mine they have and what they're charging for them. See I'm an importer, which means I bring in specific breweries beers into Australia and then wholesale them to other bottle shops. I'm a wholesaler I'm only allowed to sell my alcohol in bulk, 9 liters at a time. Due to that fact I want to make sure that my public customers get the cheapest possible rate that I can. Hence I scan the other bottle shops that buy from me. So as I'm wondering through this bottle shop all I'm seeing beer wise is Corona, etc. Nothing highend beerwise which is what I deal in. Then I scan the whiskies. Normal range that you can find at any other bottle shop. Vintage and a Select Reserve in 100ml bottles on top of 3 glencairn shot glasses. Especially since I've had the Select Reserve from 2006 and have enjoyed it. I pick up the gift set, join my wife and then we head for home. Fast forward a month and I've just come home from work and I'm feeling the urge to try a new whisky. I look at my lovely wife and we decide to crack the 1995 Vintage open to see what we can see. 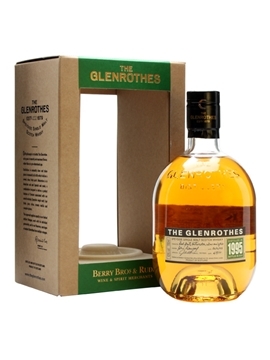 Now it's in a 100ml sample bottle and it was distilled in 1995 and bottled in 2011, making it 15 to 16 years old. Call it 15 years to be safe. The aroma is fruity with lots of citrus, some spices and hints of honey and butterscotch. But sadly the citrus seems to be dominating the nose and everything else is catch is as catch can. When my wife and I take a drink we get lots of oak, lots of citrus, and some hints of butterscotch. Enough so that my wife won't take another drink. Enough so that I've struggled with this dram, this whisky, both times that I've had it over the last two days. It's rather a pity since that butterscotch aspect is really quite lovely, but is sadly overshadowed by the oak and citrus. decent reviews from other reviewers, but for my wife and myself this is just not a pleasant whisky. Even worse is that this isn't a cheap whisky. You will have to look around to find it, but you'll probably spend around $100 to $120 AUS per bottle. Personally if you can find it find the Select Reserve from 2006 and just spend $75 odd AUS and enjoy that instead. Hopefully the other samples are much better.